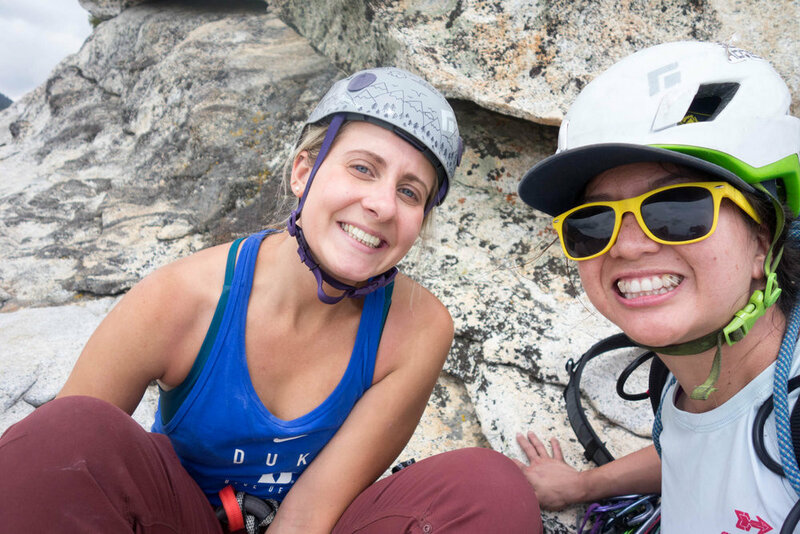 I met Liz at the Women’s Climbing Festival in Bishop in February of 2018. We connected via the Facebook group to establish accommodations and camp together in the pit during the festival. I didn’t spend the whole festival hanging with Liz but definitely sharing the spot with her made me feel like she was my home girl. She was easy to get along with because of her positively and roll-with-the-punches attitude. She didn’t share an ounce of anxiety or anger when both of our staked tents tumbled several campsites over fireplaces and rocks due to high winds. Both of our fragile tents were ripped inconsolably but she didn’t spend a moment being annoyed about it. She seemed like the perfect companion for an all day adventure, and I filed that info away for later. Liz was my first choice when this weekend came up. Some of my friends were heading to Tahquitz this weekend and asked me if I wanted to tag along. My normal climbing partner and boyfriend was out of town for a family obligation, and I have been itching to invest in new climbing partnerships anyway. I originally planned for us to climb The Trough (5.4). 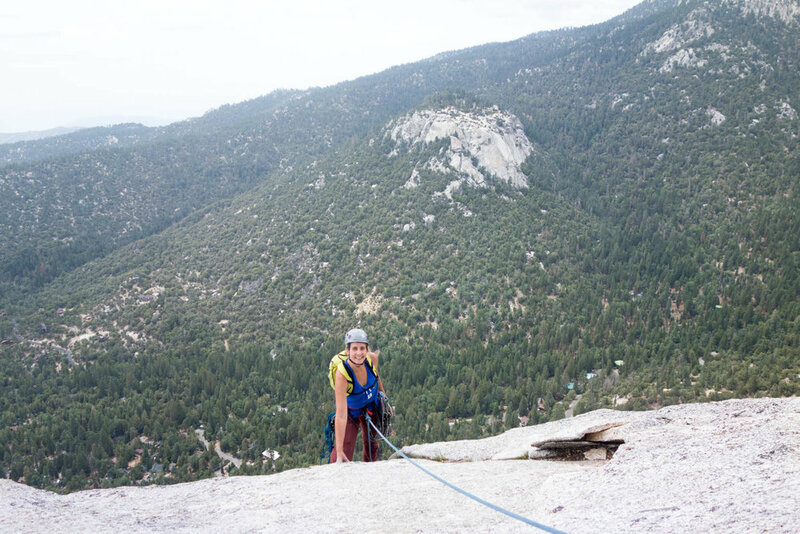 This route is the easiest route up Tahquitz, only 4 pitches, and has historical significance by being the original ascent up the rock. It is an awesome first lead because the placements are large and it just eats up gear, and there is no chance of losing the route because it follows a natural weakness up the face all the way to the top. Its probably the least contrived way to get up Tahquitz. I climbed it with Robin last year. 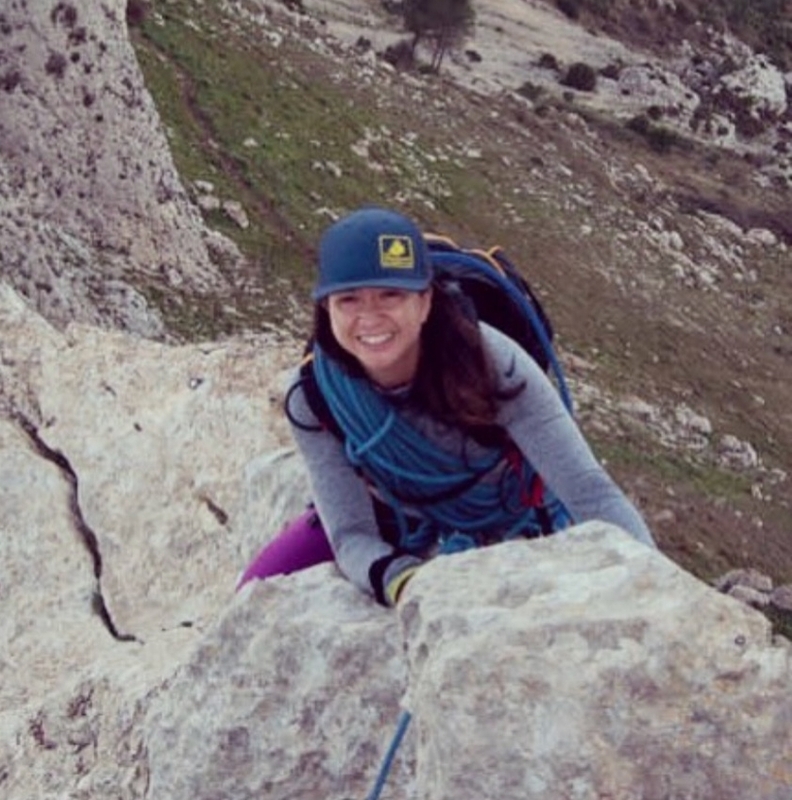 Liz had experience doing alpine style multipitch as a follower but has never led a trad route before. I remember when I was starting out climbing (And after 7 years its not that I’m like, not still starting out) that I was frustrated that my more experienced partners never wanted to climb something easy enough for me to practice my leading skills. I want to nurture my climbing partnerships because there is nothing more special than someone who will explore the world with you because their goals align with yours. (Like my relationship with Joyce and her mountaineering objectives). I think its fun to lead in general, and I wanted to give Liz that opportunity to swing leads with me if it struck her fancy. I also wanted to pick a route where I would have enough energy to lead every pitch if Liz just wasn’t feeling it. My four friends also planned on climbing The Trough. Brian had the most multipitch experience of the group, and was planning on taking his girlfriend Andrea, her brother John, and her sister in law Christina up the route. 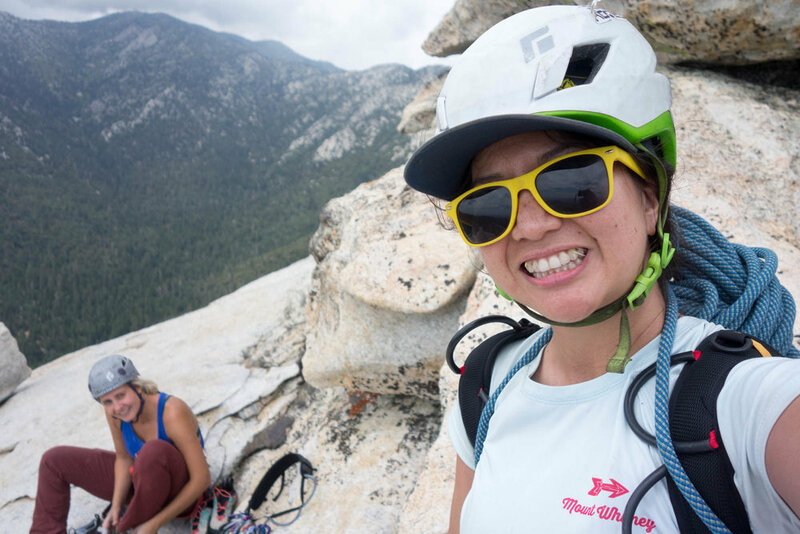 It would be Andrea’s first multipitch, and John and Christinas first multipitch unguided. Since they knew I would be rambling up the path around 8pm with Liz, they decided to head out at 6pm to stagger us out a bit. Unfortunately 8pm is the peak time for climbers getting an early but not an Alpine start. We got to the base of The Trough at around 9:30, and there were 2 groups/5 people in front of us waiting in line, not including Brian and Andrea already on the wall and John and Christina just beginning to pull up their second. I calculated a 2 hour wait at least. I pulled out my well loved/battered book Best Climbs in Tahquitz (as far as I can tell, the only book on the subject), to find another route that met my criteria as both beginner friendly and something I’ve climbed. We settled on Finger Tip Traverse, (5.5). I remember climbing it before and it being super chill and mostly low angle, with some very memorable and classic moves. Some of the moves that stuck out in my mind were a 30ft finger traverse with good feet, an arch like corner that you have to lieback, and climbing a tree to move onto a face. Its like almost too much good stuff for a 5 pitch 5.5 rated climb. Liz, being her incandescent self, agreed without me having to bully her into it. It was a fabulous decision. We walked over to Finger Tip Traverse and observed that there was only one party in front of us, and they were already starting their third pitch. I showed Liz some very basic anchor building skills and observed that we didn’t bring a second cordelette. (and shoot, I had a second and left it in the car). I gave my cordelette to her and resigned to building alpine style sling anchors all day. I led the first pitch that’s just a class 4, but I remember there being an airy move or two that I didn’t mind being roped up for. It would have been a good one for Liz to lead but we decided that I should set up the first anchor so she could look at my set up one more time before she set up her own. The second pitch was the tree climbing pitch. It was a good one for Liz to lead because it was only 50ft long and went from one set of trees to another, so the route finding was not a thang. She started out good, having to move from the tree to the face. She felt reservations about doing that exposed move, and it was a good team building moment as I attempted to coax her into it. The rest of the route was straight forward. She didn’t extend any of her pieces with alpine draws so the rope drag was so incredible it took half an hour to pull up the rope and put me on belay. I watched the rope slowly move through the trees in forearm length pulls, punctuated by rests, just hoping that Liz wasn’t burning out her biceps too badly for the rest of the climb. The third pitch was when things got spicy. There was a team directly adjacent to us on finger trip (5.7). I figured that my route was supposed to stay right of him, and I got myself off route as well. I pulled a few enjoyable corner moves that felt like the were 5.7 or so. I spied a piton that I thought I had to traverse over to, but I didn’t want to do an exposed slab traverse when Liz had slack on the rope over 70 feet away. I set up a painful 4 piece alpine anchor over a very hanging belay, knowing that this can’t be right. A couple sitting at the Jungle Ledge casually yelled at me that I was off route, and so was the Finger Trip couple next to us. Finger Trip couple took my bomber belay ledge, and I was supposed to start traversing for pitch 4 where they were, 10 feet down and to the left a few 5.7 moves below me. I pulled Liz up and asked her to set up an anchor on top of the Finger Trip couples Belay ledge so she could tension traverse me to her. I asked her to do this so both of us don’t end up on my hanging alpine anchor of death. One of my pieces popped as I pulled her up on toprope. I am glad I set up knots in my slings like I learned at Red Rocks Rendezvous or I would have loaded only two cams instead of the remaining three, I observed. Its nice when you can look back on classes and decide its money well spent. Still, seeing a piece pop scared the dickens out of me. I asked Liz to PAS into her pieces as she set up the anchor, knowing that it would take her a moment to build the anchor to her satisfaction. I tried to do that as urgently yet as not scared as possible. If my anchor popped we wouldn’t be connected to the wall in any way since she collected all of the pro below. I timidly traversed over the 6 feet of no feet air back on route as Liz belayed me over. It was high drama in front of an audience of 6. Liz felt a little intimidated by the pitch I had just led. She didn’t have to do the 5.7 moves since I asked her to traverse before getting to that spot, but the 5.5 handjam sized corner was a little tricky, and the book admitted that too. Seeing as we set up a second anchor and Liz had all the rope and me on Belay to get me across the traverse, we decided that we would be better off if I led the next pitch. I secretly wanted to lead the money pitch traverse anyway. In retrospect I should have asked her once again if she was sure, because sometimes I scare myself on top rope into thinking I can’t lead something. Every time I’ve relinquished a lead I’ve regretted it (because you miss 100% of the shots you don’t take). But my secret motivations came out and I led the name sake traverse. I love that traverse. I loved it the first time I climbed it, and it was just as enjoyable now. Its only a 5.3 move but it has slabby feet, and good hands in a flared ridge. I sling the bushes growing in the crack along the way for protection. The exposure is intense. It was the sort of lead that would be a mind game for a new leader but nothing but fun for me. I remember I took 3 times longer to lead it last time I did it. I’m wishing I hung out a little longer. I set up a belay at a huge mountain mahogany at the end of the traverse. Liz came up and came grateful that she didn’t have to lead that pitch. She says she couldn’t have done it. It may have been a little adventurous as a second trad lead ever, but I think she could have. The book told me that the next pitch is the last, and having done this route before I know things get a little hairy around lunch ledge. I was not looking forward to the 5.5 slab, and was hoping to find the 5.0 crack that people keep telling me about. I glanced at the book that told me to move right (or so I thought), and started leading us into the abyss. I didn’t extend as many pieces as I wanted to because extending the pieces too far can drop you onto a ledge, but pulling over the ledge with unextended pieces leads to some crazy rope drag. I didn’t know where I was somewhere 80 feet from the top, but there was too much rope drag for to explore adequately. I set up another belay and belayed Liz up. She got to me and said that those ledges were a little hard for a 5.0. I apologized to her for getting off route. I was concerned, but honestly, I wasn’t as worried as I have been in that situation. Maybe I’m getting to the point in my life where a lifetime of stress allows me to take these things in stride. Maybe I’ve been exactly there before and the outcome was always okay. We were only 5 pitches off the ground (probably 7 rappels or so), but we were only a pitch or so from the top. The commitment level was higher than cragging, and I didn’t feel consumed by it. Liz didn’t seem too worried but I could tell the novelty was wearing off and she was ready to get off the mountain. The book suggested that the an alternative route best done in two pitches from lunch ledge has you moving right up to a 5.6 finger tip lieback. I hoped that’s where we were. As Liz put me on belay and I observed that a tree had 4 bailout slings on it. So other people had been there before. Liz observed when passing the same spot that three cams were directly adjacent. (holy smoke, 3!. Imagine how scared you must be to leave $150-$200 worth of gear to bail). We would have stopped to harvest the booty if I was observant enough, but I wasn’t. I saw the fingertip lieback crack. It looked like it would go. I started climbing up it and notice that there were pockets for finger tips, but not consistently. You frequently had to choose if you wanted to sneak in a 0.3 cam for pro or place your finger tips there instead. You had slab for feet. I ended up running it out, and having fun doing it. This off route adventure led to an incredibly enjoyable pitch. During that pitch I communicated to Liz that I was scared. She was under a ledge so she couldn’t see me. So normally I’m used to saying these things to Robin and he will respond with, “I got you!” or “I’m here with you baby!”. I’m not used to my vulnerable utterances during leading striking fear in my belayers heart. I realized then that I was just fishing for reassurance. So I called down, “Don’t worry, I got this!” Which is maybe what I should always be saying to myself when leading. Either way, that exchange made me feel strong. After the awesome 5.6 finger tip lieback the route sloped off and hikers were sitting at the top having lunch. Its always funny when you think you are off route and panic starts to rise then the tension releases when you see other people chillaxing and literally having a picnic. One of them congratulated me and said, “Nice job!”. "Thanks!" I responded, trying to look cool like I just climbed a mountain or something. I set up my last anchor and pulled Liz up. She was a little bit concerned that we weren’t actually at the top but at that point things were looking entirely familiar. I was feeling psyched that we snuck in a 5.6 pitch and did the route in 6 pitches and still finished around 2:30pm. I hoped Liz was still having fun even though some totally par-for-the-course trad stuff happened and I only let her lead one pitch. We descended via the friction descent and met up with my four friends who did the trough that day down in Idyllwild. We ate a very early dinner at Café Aroma where my Trough friends had made reservations. I was famished and to my dismay it was a very nice restaurant. They had live music and people were showing up wearing their evening clothes. Brian insisted that its okay that I looked like a ragamuffin with dirty hands stinking to high heaven from exertion because there was outdoor seating and they don’t call it “Café Aroma” for nothing. I ate a delicious pasta meal and we ordered wine for the table. This is why I love going with new people on adventures: you experience the same places an entirely different way. I never would have attempted to relish in fine dining after a multipitch, but it was a wonderful way to end our adventurous day.